Almost a month ago, if you recall, I saw a Sage Thrasher (Oreoscoptes montanus) that had wandered up into the Rocky Mountain Trench and looked quite out of place in the Bush Arm of Kinbasket Lake, northeast of Golden. The wave of interesting Great Basin species this spring in British Columbia left me optimistic that my work trip back in the Rocky Mountain Trench - the Golden-Mica Creek-Valemount circuit - might turn up an interesting bird or two. My optimism was elevated even further when I received an e-mail from James Bradley with a photo attached depicting a female Lark Bunting (Calamospiza melanocorys) found in Valemount. The deck seemed to be stacked in my favour, so I birded from the Monashee Lodge to the Mica Creek camp after putting in a wet work day. I was interested in wandering around the Mica Creek camp because it seems to pull in some interesting birds due to the matrix of disturbed habitats around the buildings (including a small golf course). Last year I saw a rather lost-looking Yellow-headed Blackbird (Xanthocephalus xanthocephalus) feeding around the buildings, and a few years ago Jamie Fenneman had a male Rose-breasted Grosbeak (Pheucticus ludovicianus) there. 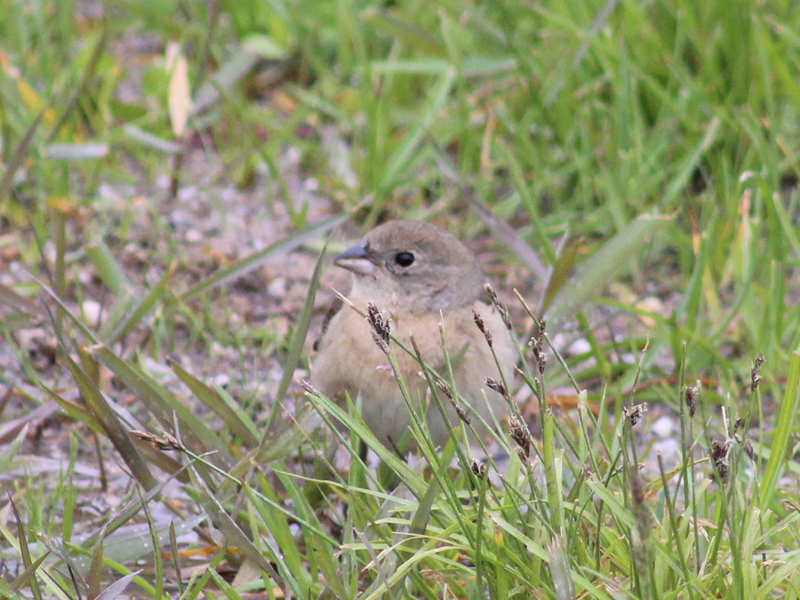 Once I reached the camp, I was immediately rewarded with a female Lazuli Bunting (Passerina amoena) feeding on a lawn near a flock of Brown-headed Cowbirds (Molothrus ater). I am not used to seeing Lazuli Buntings hopping around on the ground in the open, so I followed it for a bit and took a couple photos. The tawny wash, bicoloured bill, and white wing bar peg this rather drab bird as a female Lazuli Bunting. She's definitely not as flashy as the male counterpart. The Lazuli Bunting flew a short distance around the corner of a building into another lawn area with gravel patches. I was distracted for a minute by writing down other species, then turned back to the bunting and noticed there was another bird nearby. When I focused my binoculars on it, I was surprised to see it was a stunning male Lark Sparrow (Chondestes grammacus)! Lark Sparrows seem to turn up in weird places in the spring in British Columbia. Considering their breeding range in the province is primarily in the Okanagan, they should be looked for anywhere between the coast and the Rockies. As you can see, Lark Sparrows are quite striking with their bold black, chestnut, and white face pattern. They are definitely one of the nicest sparrows going in the province and it's always a treat to bump into one! The Trench Fever is running strong these days. It truly feels like you can just walk out the door and encounter just about anything. Maybe this will be my good bird of the trip - I'm definitely alright with that! Maybe, the Rocky Mountain Trench will be the next Sandspit, QCI? I hope so! Good post! 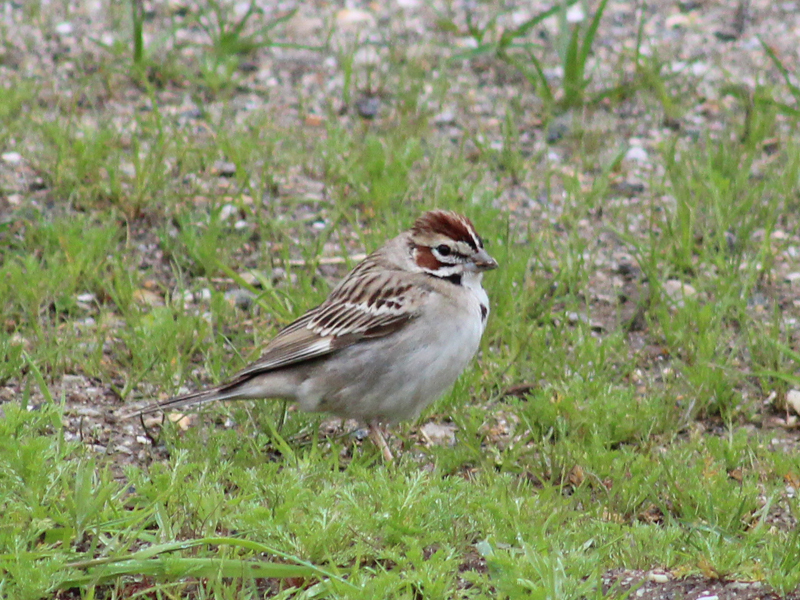 For the record, the Lark Sparrow was not the end of the good bird parade. I went birding around Mica Creek again and found a female Black-headed Grosbeak and a Western Kingbird, which are both pretty scarce in the area. At Sprague Bay (approx. 20 km away), there was a singing Yellow-bellied Flycatcher. Up in Valemount, the icing of the cake was a pair of Rock Wrens.